Loaded with work? Need resources to complete quarterly goals but don’t have the capacity to hire full-time employees? You need part-time employees. In today’s modern world, part-time employees are there to save the day. Whether it’s a quick web project, a translation or an administrative helping hand, part-time employees can help you achieve your goals without stretching your budget. The only problem in this perfect strategy is finding the right part-time employee. Do you want an experienced individual who can work part-time or do you want young talent? Remember, the point of hiring a part-time employee is to get a short-term task completed within a set deadline and a set amount of budget. It is imperative for you as an organization to be very clear about your requirements, your schedule, and your budget because part-time employees are not just students looking to earn the extra buck. They could be stay-at-home parents, freelancers, retired folks, and anyone who wants to earn additional income. Since part-time gigs are short-term, a lot of people may be reluctant to pick the job unless they see a good budget and a manageable schedule. This essentially means that if you don’t use the right methods to attract part-time employees, you may end up wasting precious time looking for one instead of getting someone onboard immediately. 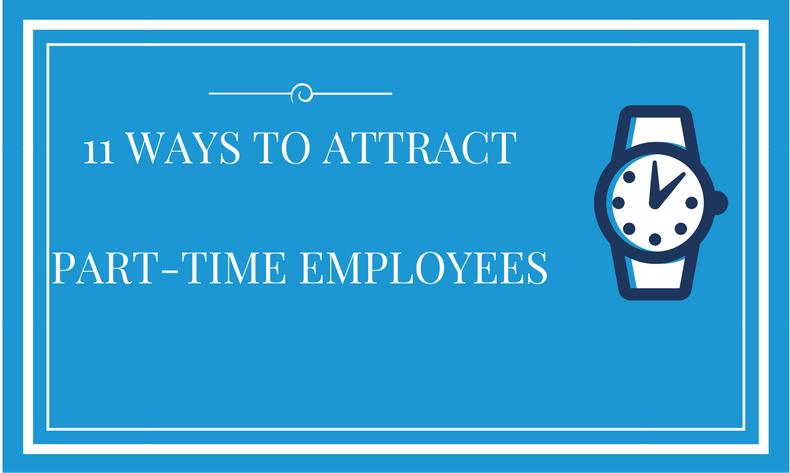 So how do you attract the right part-time employees? Here are 11 ways to do so! Part-time and freelancing platforms abound. Upwork, Hubstaff Talent, Fiver, People Per Hour, Freelancer, etc., are some of the most popular platforms to find part-time talent. Most of these platforms have talent who are available to manage online businesses, and have skills varying from programming to writing, to virtual assistance, to graphic designing and so on. If, however, you’re looking for people to fill a physical role, you might want to try posting on Facebook, Craigslist, and LinkedIn. Know that each platform has its own user base and you can only get the right talents if you know the use of the respective platforms. Take some time to understand the top platforms and draft a job post that suits the audience of those platforms. Remember though that selecting candidates from these platforms could take some time, especially since there are at least 50 proposals to one job posting! One of the most popular methods of recruiting high-quality talent is via LinkedIn. In fact, jobs posted on LinkedIn have a more legit feel to it, especially if you have an active company profile. Similarly, there are high chances of attracting the right employee through LinkedIn since the platform acts as a database of the world’s best talents. It also gives you the leverage to scan through applicant profiles and decide whether you want to hire them or not. It saves screening time and ensures you have multiple choices to choose from. The secret to getting the right candidate for any job is to post an accurate job description. It should contain the number of hours required, the budget, the location, the main role and responsibilities, and the expectations from the candidate if any. Know that when you post an accurate job description, only serious candidates will approach you. If on the other hand, you post vague job openings, you’ll only end up dealing with tons of applications but none that brings you any closer to picking the right candidate. Each job description must either be created or be checked and approved by the team leader/manager or member that is looking for a new hire. Most employees make the mistake of underestimating part-time employees and consider them as mere external entities who are supposed to just finish a short-term task. They fail to build a relationship with the part-time employee because they fail to think long-term. As organizations grow and as businesses expand, there will always be a need to hire additional help to take care of short-term tasks and goals. This essentially means that in the future if you need any similar nature tasks to get done, you could easily approach your tried and tested part-time employee instead of hiring a new person. When part-time employees work with an organization, they too look for chances to build a long-term relationship with a client instead of doing short bursts of work. If possible, attract the right part-time employee with a possible career growth for the future. Also allow them the privilege of building a long-term association with your organization. Any serious employee looking to build a career this way will definitely show their interest in the job. Whoever said part-time employees cannot get benefits or incentives? Just because they are working from home or just because they don’t work full-time at the office doesn’t mean they shouldn’t be entitled to certain benefits and incentives. If you offer quarterly bonuses to your full-time employees for completing certain tasks, then you could also do the same for your part-time employees. Incentivize them with performance-based bonuses or help them attain an online certification that can enhance their skills to the benefit of your organization. When you create incentives that feel like an actual job, you’re attracting employees who will treat this not as a gig but as a job where they will be awarded for their performance. When you hire part-time employees, you’re hiring them for a few hours and this means you need to maintain your side of responsibilities and ensure that you don’t communicate with them or coordinate with them outside of those hours. Create fixed working hours and carry all your communication and coordination within those hours. You’ll see your talent run away in a jiffy if you hire part-time but are demanding full-time attention. Creating these boundaries will ensure that both you and the employee have a proper schedule to follow through. Less chaos, more productivity. Many part-timers complain of an organization’s lack of planning and disorganized nature as the reason they have to stop working for them. No matter how good your incentives or no matter how flexible your routine, if you don’t have the right plan of action and the tools to get things done in a systematic manner, you’ll be wasting your time, money as well as creating a negative experience. When part-timers work with you, they expect things to have already been planned or managed to an extent. They don’t expect to start from scratch within the limited amount of time that they have. Use project management tools like Asana or JIRA to keep up with project deadlines, track hourly time, manage progress, and create performance based reports. The fact that you are organized and have the right tools ready to get the job done will increase productivity double-fold and before you know it, your part-timer may get the job done faster than you anticipated. If possible, define this in your job description or when you hire the part-time employee. Let them know what is expected of them if they join your organization. Be upfront about your goals so that your employee can align their schedules accordingly. It would be quite counterproductive if you want X amount of work in X amount of hours, but your part-timer cannot afford more than Y amount of time. It’s always good practice to make sure that you have your goals in place and that both you and the part-time employee know what is expected of them within a certain time period. Yes, this is the elephant in the room. You want a part-timer because you want to hire them at a lesser cost, which essentially means that you don’t want to pay them the amount you’d pay a full-timer. That being said, you don’t have to pay them a measly budget either. Know that good part-timers are hard to come by and the best ones have a good idea of their worth. If you have a low budget, you’ll only be attracting people who don’t have much to offer. Have a good budget that aligns with the amount of work and tasks you need to get done. Do you want to hire your part-timer on an hourly basis, milestone basis or project basis? Be very clear and specific with your budget as this later becomes a point of discord between the two group. Freelancers and part-timers are mostly afraid of not being paid on time or being cheated of their effort. The best contractors will always ask you for an NDA or for a methodology that ensures they get paid in time for the work. If you’re an organization looking for serious work, make sure you have all your documentation ready. Have an NDA signed, create invoices and pay slips and make sure everything is legalized. This kind of transparency will bring you the best talents who will put in double the effort to deliver high-quality work. A part-timer has as much right to know about your company as a full-timer. Don’t be afraid to talk about your organization. Share your vision, share your progress, share your future aspirations, share your expectations. Talk about your company, make the part-timer feel part of your organization even before they have started working with you. Be inclusive instead of exclusive and you’ll see the value that part-timers can bring to your organization. The world is gradually moving beyond fixed hours and fixed job roles. It’s now more about outsourcing work to specific talents than hiring groups of people. The work sphere is seeing a dynamic shift, and organizations should be well-equipped to manage this shift if they want to be progressive and move on with new age trends.